Beeman’s art covers a utility box at the Irish Hills Plaza. In February, San Luis Obispo put out a call for artists, looking for local talent to submit ideas for painting 26 utility boxesaround the city. The city’s park and recreation department received over 200 submissions, and in the end, 19 artists were selected. This week, those artists started their painting projects. 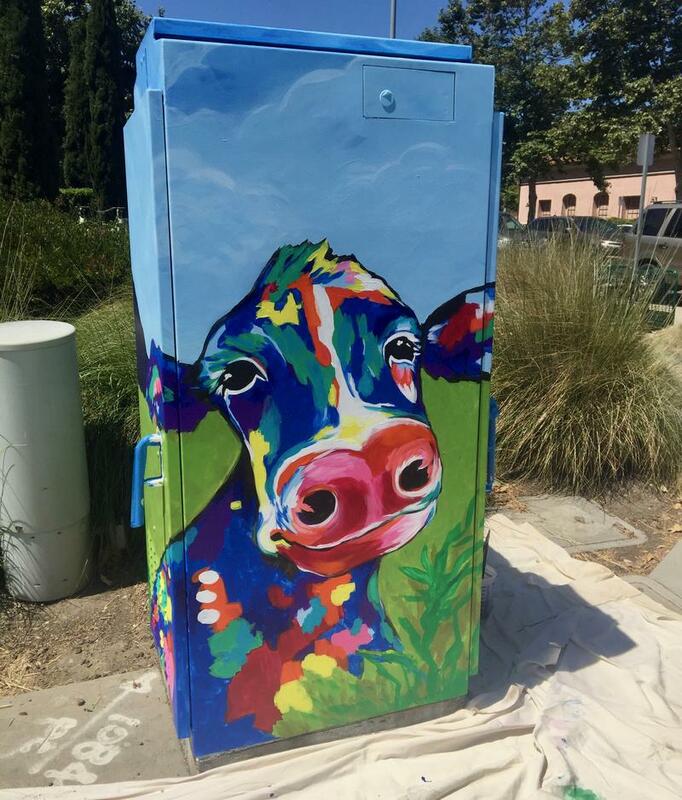 Lindsey Stephenson of the city’s park and recreation department said a few of the artists will be painting two boxes, like the North County artist who was out Monday morning on Los Osos Valley Road. She is painting a utility box near the entrance to San Luis Obispo’s Irish Hills shopping center. Beeman said the city gave the selected artists a template, which an art jury vetted. Her boxed mural features California poppies, a landscape and barn…and a pretty happy looking cow. Beeman got most of the utility box covered on Monday morning, until the hot weather interfered with her acrylic paints. The utility box painters will be working on their artworks through August 20.